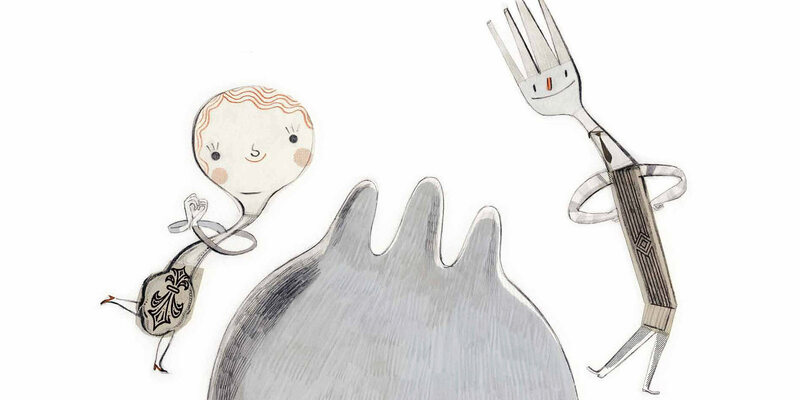 A short trailer for Kyo Maclear’s new children’s book, Spork, published by Kids Can Press. Illustrated by Isabelle Arsenault. My husband and I “invented” spork on the eve of our first son’s birth. We were very pleased with ourselves–weren’t we clever! (Spork! A hybrid form of flatware. A delicious portmanteau!) Then one afternoon, as I was walking down by Toronto’s Harbourfront I noticed a kitchenware store called Spork and Foon that was having a “Going Out of Business” sale and realized that we weren’t as original as we had thought. Was it a bad omen that the store was going out of business? Possibly. Was it a symptom of society’s tendency to neglect its mongrels and misfits? Perhaps. After purchasing a discounted garlic press and delivering a few words of condolence to the cashier, I decided it was time to move on and find out more about this “already-invented” thing called a “spork”. A spork by definition is round like a spoon, but has tines on its end that act like a fork. It’s shallow enough to consume liquids, but pronged for spearing solids. A plastic spork is the utensil of choice for the world’s most famous fried chicken outlet, which introduced it in the early 1970s, to accompany a popular coleslaw dish. Sporks are popular in school cafeterias and U.S. prisons. Why? Because sporks are harmless creatures. Try using a spork as a weapon. Not so easy. Sporks, especially the lighter titanium types, are very popular among backpackers. If personal field research is any indication, sporks are the ultimate eating utensil for very young children (aka the ham-fisted “messy things” in the story). To pur­chase Spork by Kyo Maclear, please visit your local inde­pen­dent book­seller, or order online from Kids Can Press.